ACE students take all of their core academic subjects including English, Math, History and Science in the program while still taking their electives, world language, and health and fitness classes in mainstream. In their ACE classes, students get the chance to experience engaging, experiential learning that takes thematic topics and explores them in great depth – often culminating in performance-based assessments. In addition to the classroom curriculum, ACE students participate in community building trips and community service projects which allow students to build a supportive, trusting environment. ACE also works closely with families to be an active partner in their child’s success. Parents or guardians are expected to come in three times a year to participate in a student-run exhibition on their child’s academic progress. ​1. 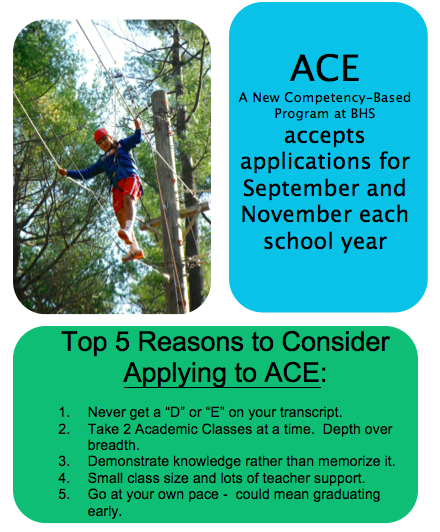 Meet with ACE guidance counselor. 2. Sit in on an ACE class. 3. Write a short essay that describes why ACE is the right match for you. 4. Attend an intake interview including prospective student, family, and ACE coordinator.